And so, after meticulously fine tuning the plans I decided to completely ignore them and walk the full 24km into Santiago.. It was another largely asphalt day so my feet were definitely not happy. It took around 5-6 hours and eventually (and with rather tender feet) we made it to the cathedral to take the obligatory photo from the square. We booked into a great hostel just a few doors up from the pilgrim office and retired to the garden to enjoy our small/medium sized achievement..
And with that, the Camino Portugese was over.. As we sat watching the sunset we chatted about the last 13 days it was obvious that this was a very different experience than the Frances..
Too much asphalt.. Not really long enough to feel detached from reality (I spent 120km leaving Porto and 120 coming into Santiago.. there didn’t seem to be a middle bit.) And the main thing that we both felt was the lack of social side of Caminoing.. the were other pilgrims.. we said hello, waved and occasionally chatted for brief periods but that was all.. No long evenings sharing wine and comparing blisters (well, maybe once but that feels like a lifetime ago) even as we walked into Santiago I could still see the groups of 2s and 3s that hadn’t grown since Porto.. In comparison Santiago was full of large groups of people that had met and shared the Frances together.. it felt like there should be a shaded corner where CP walkers should go and sit quietly out of the way. I knew before I started that this would be a very different walk.. I’m glad I walked with Celine. Having a built in buddy made things much better than if I’d walked alone. And with that in mind I guess it’s time to wash my socks.. onwards and upwards etc!! Finisterra and Muxia worth the time and less asphalt. However few pilgrims. I bet you would enjoy walking back to Sarria. Think of the stories you could tell to all you meet along the “Way”! Congrats to you, you are a winner! Two times walking the camino in one year is great. 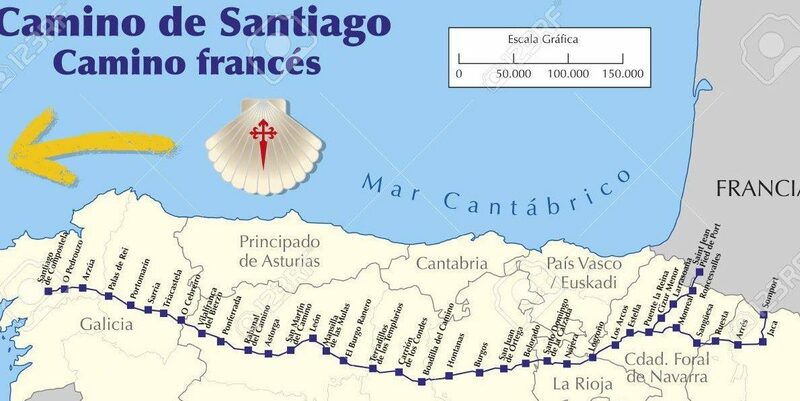 I’ll try the Camino Francés again next year but without blogging, tracking and planning. Just do it to Cape Finisterre, it is worth it! Hey Frank !! How’s it going? I was thinking about you the other day.. it’s strange not meeting you every day or two ! !